Spider veins, also known as telangiectasias or angioectasias, are small, dilated blood vessels. The affected vessels appear like thin red or blue lines on the surface of the skin or mucous membranes and look like spider webs or tree branches. This problem mostly affects the legs, hands and face, especially around the nose, cheeks and chin. Spider veins occur as a result of weak or damaged valves in the veins. Several factors are responsible for this kind of damage, including poor blood circulation, age, heredity, a history of blood clots, taking birth control pills, hormonal changes in the body, standing or sitting for long periods of time, wearing clothes that are too tight, obesity, constipation and exposure to harmful ultraviolet (UV) sunrays. Though usually harmless, they can sometimes cause symptoms like swelling, pain, throbbing, rashes and itching around the veins as well as restless legs. At times they can cause complications, such as skin ulcers, bleeding, phlebitis and deep vein thrombosis. As spider veins are more of a cosmetic than health problem, people look for ways to reduce the unsightly appearance of these veins. Many people opt for surgery, but with some simple lifestyle changes and natural remedies, you can easily reduce the appearance of spider veins, improve the symptoms, support good circulation and prevent a recurrence of the condition. Note: Consult a doctor if the veins are warm to the touch, very tender and painful. Here are the top 10 ways to get rid of spider veins. 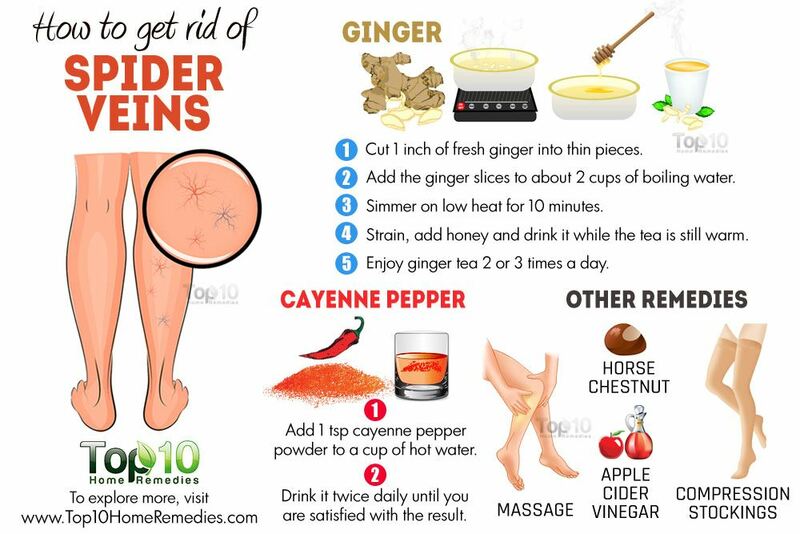 Ginger helps improve blood circulation, making it an effective treatment for spider veins. Ginger also helps break up fibrin, a blood protein that builds up in areas where your veins are injured. A 2001 study published in the Indian Journal of Medical Sciences confirms the fibrinolytic enhancing property of ginger. Cut 1 inch of fresh ginger root into thin pieces. Add the ginger slices to about 2 cups of boiling water. Strain, add honey and drink it while the tea is still warm. Enjoy ginger tea 2 or 3 times a day. Note: If talking blood pressure medication or blood thinners, consult your doctor before using ginger. Apple cider vinegar is another natural treatment for spider veins. It improves blood flow and circulation, which helps reduce swelling and pain to a great extent. Saturate a piece of cloth with raw, unfiltered apple cider vinegar. Place the cloth on the affected area for 15 to 20 minutes. Do this 2 or 3 times a day for several days. Also, add 2 teaspoons of raw, unfiltered apple cider vinegar to a glass of water and stir well. You can also add a little raw honey for taste Drink it twice daily. The herb horse chestnut helps strengthen veins and thus is very effective in reducing the discomforts of spider veins and other venous problems. It has anti-inflammatory and anti-swelling properties. A 2006 study published in Advances in Therapies notes that horse chestnut extract offers a real alternative in the treatment of patients with mild to moderate venous insufficiency. Apply horse chestnut seed gel (available in the market) externally on the affected area twice daily. Alternatively, mix 1 tablespoon of horse chestnut tincture in 10 tablespoons of distilled witch hazel. Apply it to the affected area twice daily. You can also take horse chestnut supplements. Consult your doctor for the correct dosage. Note: Pregnant or nursing women should not ingest horse chestnut. Also, avoid using this herb if you have kidney or liver disease, or if you are taking blood thinning medications. Regular massage of the affected area is another easy and simple way to improve circulation, which can help get rid of spider veins. It also helps reduce pain and inflammation. For massage, it is recommended to use extra-virgin olive oil or extra-virgin coconut oil due to their antioxidant and anti-inflammatory properties. 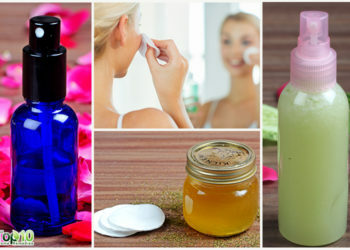 Plus, these oils quickly penetrate deep into the skin. Slightly warm the oil of your choice in a microwave. Use this warm oil to massage the affected veins with firm yet gentle strokes. Massage for 10 minutes at a time, 3 or 4 times daily. Poor blood circulation is one of the leading causes of spider veins, especially on the legs. Exercise improves blood circulation throughout the body, strengthens your body and improves the veins’ strength. Moderate daily exercise even helps fight obesity and reduces the risk of other venous insufficiency problems. To strengthen your calf muscles, raise yourself up on the balls of your feet and then slowly lower yourself back down for 10 to 15 minutes, a few times a day. Include circulation-boosting activities, such as jogging, swimming and climbing stairs, in your daily routine. If you have spider veins on your hands and legs, elevation is a good option to relieve the pressure in the veins. Elevation even improves blood circulation to the affected area. For spider veins on the legs, place a pillow under your legs as you sleep on your back. Also, keep the legs elevated for 15 minutes at a time, several times a day. For spider veins on the hands, elevate the hands by placing them on a few stacked pillows for 15 minutes, 4 or 5 times a day. To reduce the discomforts of spider veins on your face, sleep on your back with your head slightly elevated with the help of soft pillows. Your head should be at least a couple of inches above your body. Compression stockings, which are readily available in knee-high, thigh-high and waist-high lengths, are very helpful in reducing the discomforts associated with this vein disorder. However, compression stockings are effective only for spider veins on the legs. These stockings, when worn during daily activities, provide extra support and relieve symptoms like swelling and pain. They also help improve blood circulation. Before buying compression stockings, consult your doctor for advice on the type of stockings and how long you need to wear them to reduce the appearance of spider veins. Witch hazel is another very effective herb that helps reduce symptoms of spider veins. The tannins and volatile compounds in it help strengthen blood vessels, which in turn reduce the appearance of bulging veins. It helps tighten distended veins and repair their normal structure. Plus, it helps reduce the pain and swelling. Dab a little witch hazel extract on the affected area and leave it to dry on its own. You don’t need to rinse it off. Do this once or twice daily until you notice improvement. 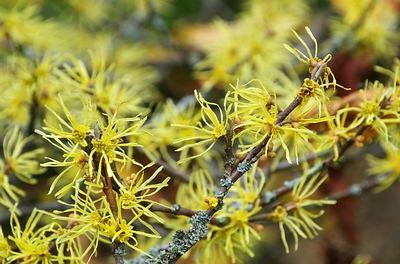 Another option is to steep ½ cup of witch hazel leaves in 1 cup of hot water for 10 minutes. Remove the leaves and allow the water to cool. Apply this water on the affected veins using a cotton ball. Leave it on for at least 15 minutes, twice a day. 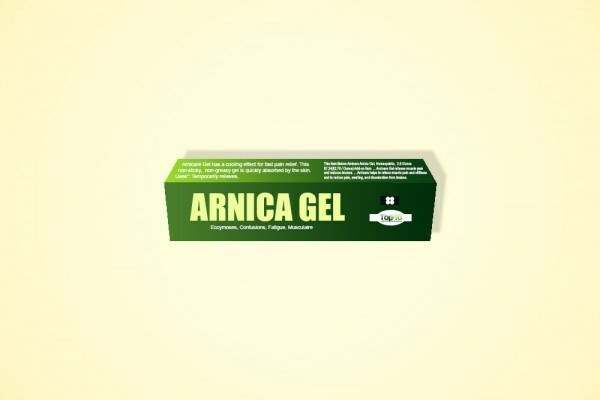 Arnica, a very popular herb used in homeopathic medicine, is very helpful for relieving the aches and discomfort of spider and varicose veins. This herb contains several compounds that help reduce inflammation, pain and swelling. It even constricts the veins due to its anti-inflammatory property and helps reduce the bulging appearance. Apply an arnica-based gel or cream on the affected area, 2 or 3 times a day. You can also take arnica in pill form, but only after consulting a doctor. 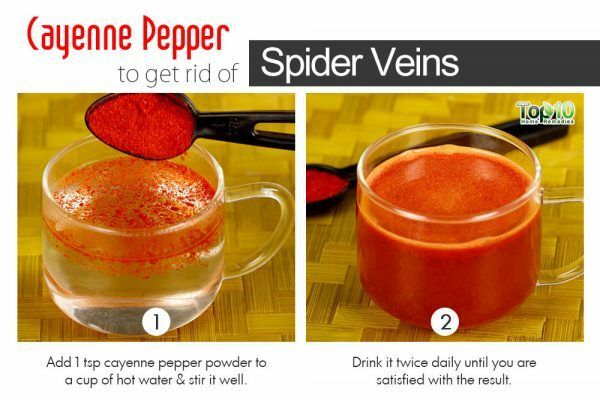 Cayenne pepper also helps treat spider veins and other problems linked to poor circulation. The compound capsaicin in cayenne pepper promotes blood circulation and eases the pain of congested, swollen veins. Add 1 teaspoon of cayenne pepper powder to a cup of hot water and stir it well. Drink it twice daily until you are satisfied with the result. To reduce pain and swelling, apply capsaicin cream or gel on the affected area as needed. Note: Intake of cayenne pepper is not recommended for pregnant or breastfeeding women. Avoid sitting or standing in the same position for a long time. If you are obese, try to lose the extra pounds and maintain a healthy body weight. Wear comfortable shoes and avoid wearing high heels for long periods of time. Do not wear girdles, tight pantyhose, garters or any other tight-fitting clothing. Wear sunscreen when going out to protect your skin from the sun. Exposure to the ultraviolet rays of the sun is a potential risk factor for developing spider veins. Stop smoking and limit your alcohol intake. People who smoke and drink in excess are more likely to develop spider veins. Keep a close eye on your salt intake and try to follow a low-salt diet. Include high-fiber foods in your diet to reduce the risk of constipation, which may aggravate spider or varicose veins. Including more antioxidants in your diet will help maintain strong and healthy veins. Keep your body hydrated by drinking an ample amount of water, fruit juices and green tea on a daily basis. Comment:thanks a lot,I have been looking for a way to reduce my or remove it completely but can’t,I have used all type of things but it didn’t work. am so grateful that I came across this information am going to try n if it works I will be really grateful,thanks in anticipation. b. nourishment. Those 21/2 pounds of organic minerals are what keeps the millions of functions within the body working harmoniously. Lacking one of those minerals…poor health results. It really is this simple? After many years as a dr I can assure you this is so. Calcium deficiency is the cause of varicose veins & capillaries! The calcium provides the strength to the tissues. Deficiency & the vascular system slowly & surely breaks down. outside & inside. Yes, the vessels in the heart also! Best supplement to rebuild organic calcium? NO calcium supplements..they will only aggravate the problem. Dr Christophers Cal tea with comfrey. Isolate a substance, then you have a medication. Medications Always have side effects. A Whole plant, the way the Creator designed it? No, one needs much larger amounts than of a medication, & it takes longer to have an effect. However, the healing is sure, & there are no side effects. Only side benefits! 3 mugs of the tea daily or a teaspoon of the powder in a little warm water with honey or yogurt twice daily WILL get rid of the varicosities in no time! Powders or tea Are definitely preferable to capsules. Why? that’s a conversation for another time. Compresses are also important. Go to Dr Christophers Legacy page or products page to find more information & directions. Why do I bother to write this? & for free no less! because I suffered from varicose veins myself & spent a lot of time & money going up & down blind alleys. This works! And many patients…even elderly patients with varicose ulcers & the tissues blackened have had remarkable recoveries. I had varicose veins on the back of upper calf since childhood and it only worsened over time (I’m 48). The area was about a 5″ x 5″ area and progressively increasing. I stumbled on health benefits of near inferred heat treatments, mainly for sweating out toxins in a CNS sympathetic state. I won’t go of the rails on that rabbit hole (works great for that too). But, while I was doing that (a thirty minute process in diy sauna, I started doing the last 6 minutes focusing one heat lamp light on the varicose vein area. Within about a week and a half, you could not see the budging veins anymore, only a sort of undefined sort of slight pouch. About a month and half, that was “fading’ as well. I unfortunately broke my use and will be getting back to it. However, the area did not revert but of course didn’t improve since I stopped. Oh,the near inferred light is a basic heat lamp light. You can get one at tractor supply with a 150 watt bulb for about $15 (basic chicken brooder heat lamp or food warmer light). Thank you Dr. I’m going to try this. First time I heard comfrey will help varicose veins. Thank you very much i believe in you. God prepares everything to man. All the wonders of nature God prepares it for mans sake. I appreciate for your simple but true advices. And we see the wonders and powers of God through nature, the sickness and pain today are mans creation. Foods that are not natural and medicines that cure a part of your pain and kills part of the cells of the body. All of them are mans fault because of greed and ambitions. They forgot natures made by God the fruits and vegetable are the true cure of all the sickness though it takes long process but sure. It’s amazing how it will bring good benefits for my life.